Please consider coming along to the Crowmarsh Gifford litter-picking event on Saturday 8th July. We will meet under the horse-chestnut tree at the end of Thames Mead (more or less opposite the church), at 10.30am, to collect reflective jackets, gloves, litter-picks and bags. If you can, please ring Edwina Johnson on 83226 in advance, to register your interest. Otherwise, feel free to come along on the day. Everyone is welcome! Village meeting on 19th April (7pm) at Crowmarsh School to discuss the local community plan for Crowmarsh Parish. Our Community is delighted that planning permission to construct houses on the ‘Field east of Benson Lane’ was recently refused unanimously by the elected Councillors that comprise the District Council Planning Committee. We now need to plan for the next Bloor attack on the village. We understand that Bloor Hallam are hard at work preparing a case to Appeal to have the Planning Committee decision reversed (and you thought you lived in a democracy!). They will be looking at the comprehensive list of objections to their proposal in order to try and undermine those objections; they may come back quickly they may wait until the six month appeal deadline is almost up. Either way we need to be prepared for them. The first is to get ‘Land east of Benson Lane’ currently listed as land allocated for housing in the draft Local Plan Preferred Options 2 document removed. This draft document was published the same day as the Planning Committee meeting. The second is that we need to progress our own Local Community Plan to an extent that it will make our wishes as a community clear to the Planners and to any Appeal Inspector. The second issue is that Crowmarsh Parish Council voted in favour of proceeding with a Local Community Plan at their meeting at the beginning of this month. The necessary agreements between them and the District Council are now being put into place and work has already commenced on aspects of the Plan. The Plan is ultimately put to a community referendum, so it is your plan. It will be a Parish plan so it will include North Stoke and Mongewell. Transport, including air quality in Wallingford. A lot of the underpinning evidence base is already available while additional information will need to be sought from yourselves and others by questionnaires and surveys. We will need help with this project and this is where you come in. We plan an inaugural meeting to introduce the Local Community Plan Project to you the community of Crowmarsh. A separate meeting is planned in North Stoke. The Crowmarsh meeting will be held at… on… and we look forward to telling you why we need and how we can together produce a Local Community Plan, a Plan that will ensure growth , but growth of a kind that will ensure a sustainable community. We can also talk about raising objections to ‘Land East of Benson Lane’ being allocated for housing in the District Local Plan. CRAG will also brief you on its various recent activities and development of collaboration with other stakeholders in our future development. If you feel you can help us develop our Local Community Plan, please contact the core Local Plan Team which includes Nick Robins (CRAG) [email protected] and Nigel Hannigan (Parish Council) either by messaging Save Crowmarsh on Facebook or the Parish Council also on Facebook. We look forward to working with you in order that we can Save Crowmarsh! 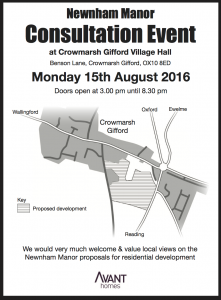 Please note: This meeting is open strictly to residents of Crowmarsh Parish ONLY. Do you need a little extra help or assistance should the parish suffer a power outage in the forthcoming winter months? If so, Scottish and Southern Electricity Networks would like to get you registered with them so they can come out and ensure you are looked after during a sustained outage. It is a free service, and any information provided is strictly confidential. See leaflet below for more information. Crowmarsh Residents’ Action Group (CRAG) is holding a village meeting to discuss proposed housing developments in Crowmarsh on Tuesday 15th November, 7pm at Crowmarsh School. To book the pavilion, tennis courts, cricket pitch or football pitches please contact Chris Strange on 07711 904252 or email [email protected]. Reasonable rates. In addition, there is also a playground suitable for under 12-year-olds and a basketball hoop which are both open-access. Please see here for pricing. Grand Opening of the new Playground and Gym equipment in the Recreation Ground. There will be a BBQ, tea and coffee, cake stand and face painting. Crowmarsh Little Pick will be on Saturday 16th March at 10am, meeting at the bus stop outside Thames Mead. Please bring old gloves if you have some. Bags and little pickers will be provided. All help is much appreciated. London Rock and White Cross Projects Partnership is announcing detail of its public consultation exhibitions for a proposed 320 berth River Thames marina development on land at White Cross Farm, Wallingford. This exhibition forms part of the public consultation prior to the submission of a planning application. Distribution of posters and information leaflets publicising the exhibition is being carried out on 10th January 2018.
at Crowmarsh Gifford Village Hall. Please come and learn about the Neighbourhood Plan process and share your ideas. at North Stoke Village Hall. Please come and learn about the Neighbourhood Plan process and share your ideas. Meet 10.30am under the horse chestnut tree at the entrance to Thames Mead. 7pm, Crowmarsh Village Hall. Tickets £10 from Sew Very Vintage in Wallingford. 7.00pm, Crowmarsh School. Presentations from the three developers who want to build major housing developments in Crowmarsh. For more information see http://www.southoxon.gov.uk/news/2016/2016-10/residents-chance-have-their-say-proposals-reduce-vehicle-emissions-three-south-oxf. Public exhibition for proposed development of the land East of Benson Lane. 4-8pm Crowmarsh Village Hall. 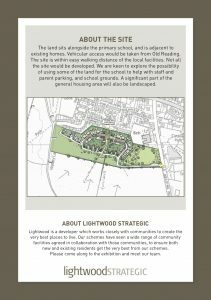 Lightwood Strategic will be holding a public exhibition on Tuesday 27th September for plans for development of around 85 new homes on land to the west of Old Reading Road, behind Newnham Green. 3-8.30pm in the Fountain Centre, Howbery Park, Benson Lane. 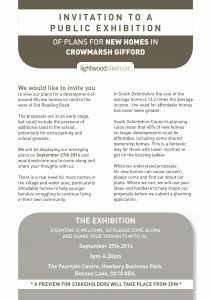 Bloor Homes will be holding a public exhibition to view proposals for a development to the land to the East of Benson Lane on Tuesday 18th October 4-8pm at Crowmarsh Village Hall. Go along to find out what’s proposed and give your views. Avant Homes will be holding an exhibition for residential development at the Newnham Manor site on Monday 15 August. The exhibition will run from 3-8.30pm at Crowmarsh Village Hall and is open to the public.